Temporal horizons and decision-making: A big-data approach (Robert Thorstad, Phillip Wolff): We all think about the future, but for some of us, that future tends to be a few hours or days from now, and for others it’s more like months or years. These are our temporal horizons, and someone with a farther temporal horizon thinks (and talks) more about distant future events than someone with a closer temporal horizon. These researchers used over 8 million tweets to find differences in people’s temporal horizons across different states. They found that people in some states tweet more about near future events than in others – that temporal horizons vary from state to state (shown below, right panel). They then asked, if you see farther into the future (metaphorically), do you engage in more future-oriented behaviors (like saving money – either at the individual or state level; or doing fewer risky things, like smoking or driving without a seatbelt)? Indeed, the the farther the temporal horizon revealed through people in a given a state’s tweets, the more future-oriented behavior the state demonstrated on the whole (below, left panel). Then, recruited some participants for a lab experiment. The researchers then compared the temporal horizons expressed in people’s tweets with their behavior in a lab task, asking whether those who wrote about events farther in the future displayed a greater willingness to delay gratification – for example, waiting a period of time for a monetary quantity if the future quantity will be greater than taking the money today. They also compared the language in people’s tweets with their risk taking behavior in an online game. They found that the language people generated on Twitter predicted both their willingness to delay gratification (more references to the more distant future were associated with more patience for rewards) and their risk-taking behaviors in the lab (more references to the more distant future were associated with less risk taking). While the findings aren’t earth shattering – if you think and talk more about the future, you delay gratification more and take fewer risks – this big data approach using tweets, census information, and lab tasks opens up possibilities for findings that could not have arisen from any of these in isolation. Extended metaphors are very persuasive (Paul Thibodeau, Peace Iyiewuare, Matias Berretta): Anecdotally, when I read an extended metaphor – especially one that an author carries throughout a paragraph, pointing out the various features that the literal concept and metaphorical idea have in common – persuades me. But this group quantitatively showed the added strength that an extended metaphor has over a reduced (or simple, one-time) or inconsistent metaphor. For example, a baseline metaphor that they used is crime is a beast (vs. crime is a virus). People are given two choices for dealing with the crime: they can increase punitive enforcement solutions (beast-consistent) or get to the root of the issue and heal the town (virus-consistent). In this baseline case, people tend to reason in metaphor consistent ways. When the metaphor is extended into the options, though (for example adding a metaphor-consistent verb like treat or enforce to the choices), the framing has an even stronger effect. When there are still metaphor-consistent responses but the verbs are now reversed – so that the virus-consistent verb (treat) is with the beast-consistent solution (be harsher on enforcement), the metaphor framing goes away. Really cool way to test the intuition that extended metaphors can be really powerful in a controlled lab setting. And, I have to admit, I had a lot of fun sharing my own work and discussing it with people who stopped by my poster – Emotional implications of metaphor: Consequences of metaphor framing for mindsets about hardship [for an abridged, more visual version, with added content – see the poster]. When people face hardships like cancer or depression, we often talk about them in terms of a metaphorical battle – fighting the disease, staying strong. Particularly in the domain of cancer, there’s pushback against that dominant metaphor: does it imply that if someone doesn’t get better, they’re not a good enough fighter? Should they pursue life-prolonging treatments no matter the cost to quality of life? We found that people who read about someone’s cancer or depression in terms of a battle felt that he’d feel more guilty if he didn’t recover than those who read about it as a journey (other than the metaphor, they read the exact same information). Those who read about the journey, on the other hand, felt he’d have a better chance of making peace with his situation than those who read about the battle. When people had a chance to write more about the person’s experience, they tended to perpetuate the metaphor they had read: repeating the same words they had encountered but also expanding on them, using metaphor consistent words that hadn’t been present in the original passage. These findings show some examples of the way that metaphor can affect our emotional inferences and show us how that metaphorical language is perpetuated and expanded as people continue to communicate. And finally, the talk I wish I had seen because the paper is great: Reading shapes the mental timeline but not the mental number line (Benjamin Pitt, Daniel Casasanto). By having people read backwards (mirror-reading) and normally, they found that while the mental timeline was disrupted: people who read from right to left instead of the normal left to right showed an attenuated left-right mental timeline compared to those who read normally from left to right. This part replicates prior work, and they built on it by comparing the effects of these same reading conditions on people’s mental number lines. This time they found that backwards reading did not influence the mental number line in the way it had decreased people’s tendency to think of time as flowing from left to right, suggesting that while reading direction plays a role in our development of mental timelines that flow from left to right, it does not have the same influence on our mental number lines; these must instead arise from other sources. One more day to absorb and share exciting research in cognitive science – more highlights to be posted soon! For me, one sign of a really good book is that I learn things I wasn’t expecting to learn. 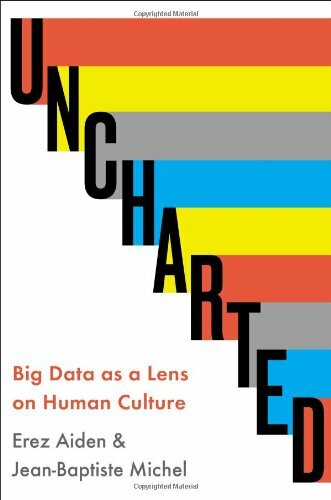 I had that experience while reading almost every chapter of Uncharted: Big Data as a Lens on Human Culture. The book is written by the creators of Google’s Ngram Viewer, which is a tool that shows the frequency of any word or phrase (single words are 1-grams, 2-word phrases are 2-grams…) in the massive and continually growing corpus of books in the Google Books database. The most informative feature of Ngram Viewer is that you can compare frequencies of different phrases to each other and see changes in their use over time (here’s a holiday phrase comparison that I made.). The book includes many ngram comparisons that are much more informative than mine. It tells the story of the Ngram Viewer’s birth, shows lots of interesting ngram comparisons, and goes more in depth on a variety of uses. Maybe the most surprising use is that ngrams can reflect censorship efforts. By looking at the slopes of the changes in frequency for different people’s names during the Nazi regime, it becomes clear that some names were being censored (those ngrams have negative slopes for that time period) and others were rising in prominence (those have positive slopes). When compared with historical records, the ngram-based conclusions are strikingly accurate. The book only shows a tiny slice of what the Ngram Viewer can be used to learn. It’s the epitome of cognitive science, piecing together wisdom from many disciplines. Ngram Viewer is a great tool, whether you’re at home on the couch wondering when the phrase “Merry Christmas” became popular, or doing paid research, and this book was a cool way to learn more about it. Merry Christmas or Happy New Year? A fun graph of the competition between the phrases “Merry Christmas” and “Happy New Year” (at least in published books that have been incorporated into Google Books) courtesy of Google’s Ngram viewer. More on this enlightening tool to come, inspired by Uncharted: Big Data as a Lens on Human Culture. y-axis: of all the bigrams (2-word phrases) contained in Google’s sample of books [written in English and published in the United States], what percentage of them are “Merry Christmas”? Of all the trigrams (3-word phrases), what percentage of them are “Happy New Year”?